ATTENTION: Now, for easier access, get to THE GIVE LIST via our shortcut: http://ncane.com/9rj then hit "CONTINUE"! Do you feel the need to GIVE more of yourself? Don't have much money, but want to know what you can do? Not enough time? Do you have money, and just don't know where to start? The GIVE List is a list of Charitable Organizations for anyone to GIVE to. Five minutes of your time, Five dollars of your money, Five letters to soldiers. These can change lives. YOU CAN CHANGE LIVES. 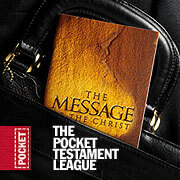 The Pocket Testament League is a 114 year old Non-Profit Org that is free to join. They run completely off the donations of believers and others. It was started by a teenager who wanted to spread the Gospel and now has OVER 170,000 MEMBERS! Members of TPTL are given (free of charge) up to 30 Pocket Bible Testaments per month to share with others. Their mission is simple, to spread the word of God. Their pocket testaments are shared in ministries across the world from prisons to parks to work places everywhere. As a member, I highly recommend not only a donation, but also membership! Spread the word today! Please Donate Generously, weather it be your time, money or kind words. GIVE! * DONATE FOOD to your local EMERGENCY FOOD BOX. * DONATE CLOTHES to GOODWILL or THE SALVATION ARMY. * VOLUNTEER at your local SOUP KITCHEN. * VISIT the elderly in your local RETIREMENT HOMES. * VOLUNTEER at your the CHURCH of your choice. * USE your talents! Offer your skills for FREE around the community! * VOLUNTEER at your local SCHOOLS. If you have a charity or cause you support and would like to see it added to The GIVE List, Please feel free to click the link below! In this day and age, it is hard to find time for yourself, your family and friends, and other things that are important to you. There are never enough hours in the day to get done what you wish you could. There is no better feeling in the world then giving without expecting anything in return. The saying is true: It IS better to give then receive. 1Corinthians 13:13 "Faith, Hope, and Love, And the Greatest is Love." Give Time. Give Money. Give Blood. Give Hope. Give Love. Give Faith. Give Sweat. Give Tears. Give Compassion. Give your Life. GIVING IS THE GREATEST ACT OF LOVE A PERSON CAN SHOW. Never forget or underestimate the power of a gift. Giving of yourself does not have to be as hard as many people make it. A gift can be the simplest thing you do in a day. Give a smile. For no reason at all, to a total stranger, say "hello" with a sincere smile! You could just make their day. Hold the door for the person behind you! Not only do they usually say thanks, but next time, they may hold it for another person. The most simple acts of kindness can spread a warmth often missing from the cold world we live in. Make sure your eyes light up when a child enters the room. They will FEEL your excitement to see them, and this will boost their confidence as well as self image and esteem! As mentioned above, visit your local retirement home. Many of the elderly population live in retirement communities today. They sit, often forgotten by their families, wishing only for a visitor. They want someone who will lend an ear to hear stories of yesteryear. They want someone to visit and play cards or Checkers with them. They only want company. You could make their week by spending a half hour of your day with a total stranger. Go through your closet, and your kids closets, and put all the clothes that don't fit or your family will never wear in a garbage bag or large box, and bring it to GOODWILL or the SALVATION ARMY! (For other ways to donate to Goodwill or the Salvation Army, click the link on the left.) The clothes you no longer desire, could be the Christmas present that a child needs. Check your cupboards! Many times, people buy food they think they'll eat, then never do. The food sits in the cupboard for months, even years. This food could be donated to your local homeless shelter or the church or your choice! The food you'll never eat could be the food that keeps a neighbor you never knew you had alive. I am so confident in The GIVE List, that I personally guarantee that not only will it make you feel amazing, but if you give on a regular basis, it WILL CHANGE YOUR LIFE! So, what are you waiting for? 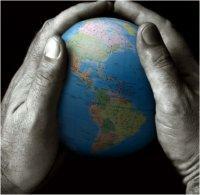 The world is within your hands. The Bible teaches it's followers to give of themselves. Jesus Gave his life so that your sins could be forgiven, and even if you are not Christian, most faiths teach to give, donate, or sacrifice in some manner.